The Pebble Pure is a mattress that is unlike all others. It has raised pebbles and 11 color choices for you to choose from. You can choose from neutral colors or bold ones. You can have light gray or a misty colored mattress, but you can also choose green, lilac, and orange, as well as many others. The color choices are beautiful and ideal for anyone who wants to create a beautiful nursery for their infant that is unlike all others. This breathable sleep system is filled with a natural coconut husk and uses 100% talalay latex in the mattress core. 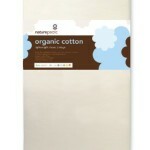 This ensures that it is organic in every way. The mattress is also soft enough that you can use a crib sheet or leave it off if you feel safer without the sheet. 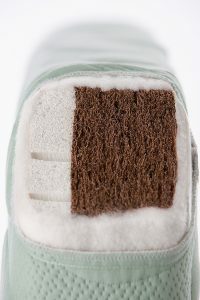 The cover of each mattress is made of cotton and eucalyptus. This cover is removable and washable. 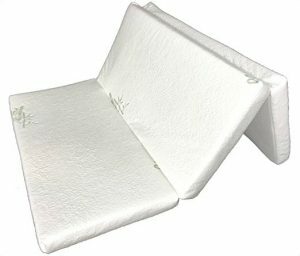 On the toddler side, you will find a natural latex filling to further ensure your little one will be comfortable. It adds more padding and further increases its water resistance. The wool is all the protection that your baby needs. There are no chemicals added to it. The wool is naturally flame resistant. This mattress is also lightweight at only 25 pounds. It measures in at 28 x 53 x 4 inches. This relatively new mattress does not have a lot of reviews, but most of the ones that are there are very positive. Most owners have given it high marks and it is proven by the overall 4.3-star rating. Most parents say that it is very comfortable and a few state that they could sleep on it if it were large enough for them. 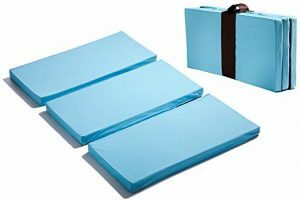 There are some parents who say that even their belly sleeper gets a great night’s rest on the Nook mattress and they feel that their little one can breathe easily while on their bellies. They love the color choices and how easy it is to clean. One downside to it is that some feel it is very heavy, which makes it a little difficult to work with. One person said that their mattress had an odor, but they returned it for another of the same type and it was perfect. Many parents do not like the price, but most say that it is well worth it. This is a choice that only you can make. 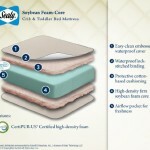 Most parents have a very hard time deciding on the perfect mattress for their newborn. Often, they want one that will be comfortable, but at the same time, it also has to be safe enough for their little bundle to sleep on without them having nights of worry. 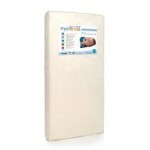 Newton mattresses are designed to be breathable, hypoallergenic, and perfect for both toddlers and infants. Does it meet expectations? Read our full Newton crib and toddler mattress review to find out. This Newton mattress is “Better than Organic” according to some. This is because it has no latex, springs, or glue. 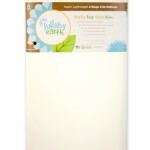 It is completely hypoallergenic and non-toxic to create a sleep surface for your infant or toddler that you can trust. In fact, it is so safe that it is approved of by many pediatricians, including Dr. Jim Sears, who has been a doctor for more than 40 years alongside his wife. It is designed to be 100% breathable. This means that in the event that your child rolls onto their belly during the night, they can breathe through the mattress. This reduces the risk of suffocation. As a bonus, the added air circulation ensures that your child will stay cool and comfortable throughout the night. This mattress is completely washable. 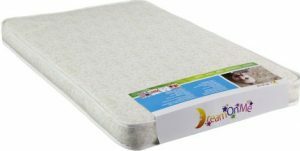 The fact that it does not contain foam or other things that may become damaged when wet, ensures it is more hygienic than most all other infant mattresses available. It is also 100% recyclable to protect the environment. With this mattress, you will never have to worry about flipping it for your toddler. 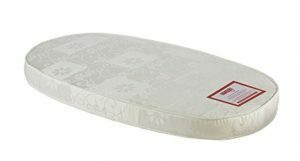 Both sides are created equal and both are safe for infants and toddlers to sleep on. The Newton crib mattress is made with 90% free air and 10% food-grade polymer. This means that it is very lightweight at only 11 pounds. 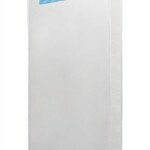 It fits all standard sized cribs and measures in at 28 x 5.5 x 52 inches. There will be no gaps between the mattress and crib rails. It comes with a mattress cover and you can purchase extras if you need to. 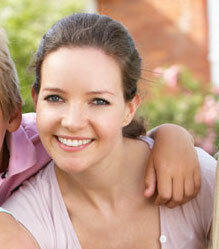 However, since the cover can be easily removed and washed, many parents do not feel the need for extras. This mattress holds a very impressive 4.7-star rating. Parents love it. Many parents have attempted to test it by breathing through it and say that they have not had any issues. 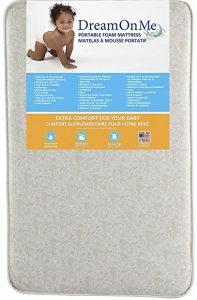 They say that it gives them peace of mind in every way and that their infant can sleep great on it. Some parents have found their newborn lying face down and although the baby was not happy about it, they were okay. The parents attribute it to the breathability and say that it is truly a lifesaver in their opinion. Out of the few issues that parents have had with it, one parent stated that their child had an allergy to something within the mattress. Upon contacting customer support, they were told that it could be a welt caused by the cover. This is not ideal, but should be solved with a new sheet or cover. A couple parents also mention a chemical smell, but it does not seem to be something that most parents notice. 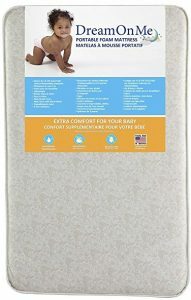 This mattress is firm enough to be used with an infant and comfortable enough for toddlers. We like that it is bacteria resistant and that you can wash all parts of it. 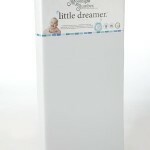 Most parents say that it is a very breathable mattress and we feel this is an important feature for any newborn. We like that it can ensure a safe sleep area for kids that is also cool during the summertime when temperatures may rise. Even the issues that some people have had can be over looked because most are not substantial issues. The larger issues that have been noted were handled by customer service, which is perfect when dealing with a crib mattress. Overall, the Newton’s mattress is definitely one that you should consider. Many parents dread spending the money for a crib and mattress set because of the fact that it is only usable for a couple years before you have to upgrade. Cribs and mattresses are not cheap and no one wants to spend a small fortune when it will be used only until their child is 3-4 years old. However, safety is important. The Stokke Sleepi promises to be better than all other cribs in safety and versatility. The question is; does it deliver on its promise? Read our Stokke Sleepi mattress review to find out. This mattress has a foam core with a density of 1.2 pounds per square inch. It is also rated with a longevity of 40ild for load deflection. 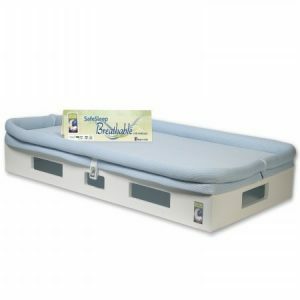 To give you peace of mind about having foam in the mattress, you should know that it is made of polyurethane, which is used in hospitals for premature infants and medical equipment. It has a cover that is non-toxic. The cover is made of damask cloth and it is water resistant. The mattress is made in the USA and meets all safety requirements. Even the seams are safe since they are made with a strong cloth binding. It is even ranked number one by Consumer Reports. It is an oval shaped mattress, which works with the oval Stokke Sleepi crib. It weighs in at only six pounds. The dimensions are 69 x 25 x 4. It is a mattress that is rated to hold up to 220 pounds. The Stokke Sleepi cannot be used with traditional cribs. However, if you purchase the crib for it, you will have a crib that your infant can use for many years. It is usable as a bassinet or crib when you have a newborn and it grows with your child until they are around 10-years-old. The crib expands from a crib to a toddler bed, and a daybed, with only an expansion that you have to purchase separately. The mattress holds a 4-star rating. Most parents say that it is a great bed for their infant that they can use for many years. They love how lightweight it is and they enjoy knowing that it is a crib set that can be used for many years. There are parents who say that their little one can play and bounce around their toys on the crib mattress and that they get a great night’s sleep on it as well. The downside is that there are some parents who feel that it is too firm for their child to sleep comfortably on it. 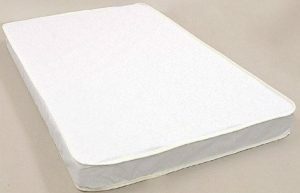 There are also parents who say that after a few years of use, the seams of the mattress may start to fail. The good news is, most all reviewers do not feel that these are problems with their new mattress and many people have used them for years already. The idea of a crib that can change from a crib to a toddler bed or a daybed is nothing new. However, we do like the odd shape of this crib. It adds a unique look to the nursery that other cribs cannot duplicate. We do feel that the firmness of the mattress could pose a problem for toddlers and older children, but like that the mattress is firm enough to ensure infants are safe. 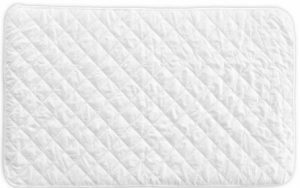 According to some parents, there are softer mattresses available, but as a parent; I would use this mattress until your child is unable to sleep comfortably on it. The mattress is affordable in comparison to other mattresses that promise to be of the same quality, but it is an odd shape which is also figured into the price. As to the potential of having to replace the mattress at some time, we do not see this as a problem. All mattresses should be changed out every few years anyway. Why not give your child the same consideration? Having a safe sleep surface is one of the most important things that you can provide for a newborn. 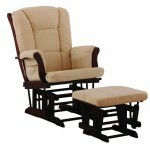 The sleeping area should be comfortable for them, but firm enough to ensure breathing is easy. That is the reason for the newest Secure Beginnings mattress being invented. The question is; will your child sleep safely on it? 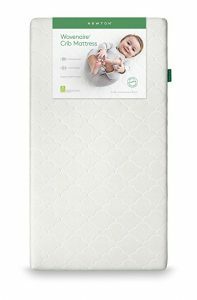 Take a look at the full Secure Beginnings Safesleep review for more info..
At first glance, this mattress looks like a bed within itself. It has a platform and a mattress pad. The pad has a bumper all the way around it. 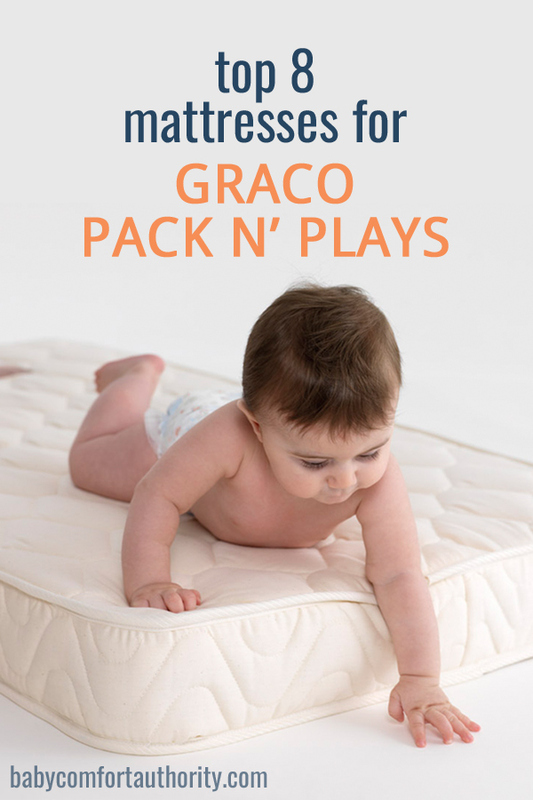 It looks different than all other crib mattresses available. However, it is designed to fit inside the crib to provide extra safety. It is available in a variety of colors. There are eight colors that range from the basic pink, blue, and white to the bolder orange and light green. All of the covers can be removed to make it easy to wash. 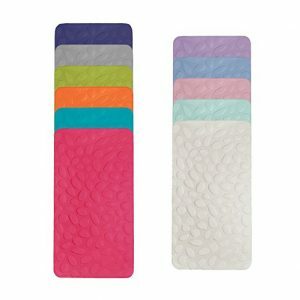 The sleep surface pad is made of 3D medical grade spacer fabric so that it dries quickly. One of the nice things about this mattress is the fact that you do not need to use sheets, bumper pads, or anything else inside of the crib. 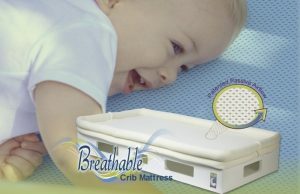 This ensures that infants who prefer to sleep on their tummy can breathe normally because the is breathable. It is thin and even if your infant turns in this sleep and puts his face too close to the pad, he will still be able to breathe. It is scientifically proven to be safer than other, thicker mattresses. This is because of the wooden base with cutouts in the side to ensure that fresh air is constantly flowing in and around under the mattress pad. 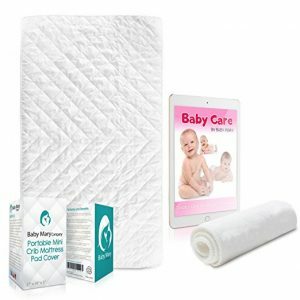 The Secure Beginnings mattress also does not contain any chemicals so that you do not have to worry about what you may be putting your baby on. This makes parents feel great about putting their infant to bed. It measures in at 50.8 x 27.2 x 5.5 inches and weighs in at 27 pounds. This makes it easy for you to move around and ensures a secure fit inside the crib that you choose. This crib mattress does not hold a very high rating. However, as you read through the reviews, you will discover that most of the negative reviews for it are from people who have never attempted to use it. They say that it is overpriced and not safe, but admit to not purchasing it to try it out. This means that the low star rating is not a very reliable source on Amazon. On other websites, you can find that it has higher ratings, and there are many people who have given it a 5-star rating. Most parents say that it is the best product that they have ever purchased. They feel that their little one is comfortable and safer sleeping on it. There are parents who say that before they put their child on it, they put their face on the mattress and were able to breathe easily. The biggest legitimate complaint about this mattress is the fact that some people do have issues putting it into the crib. 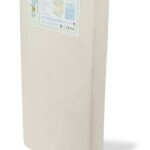 We love the concept of the Safesleep mattress. 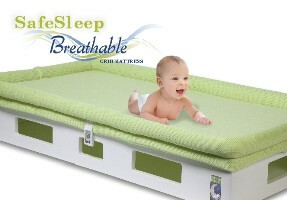 We like that you can breathe through the mattress and understand why other parents feel that it is a great way to keep little ones safe, especially those who are not comfortable sleeping on their back. 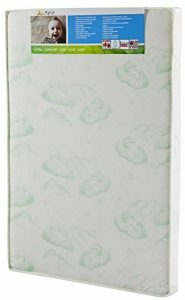 As a mom, I’ve seen crib sheets bunch up around an infant’s face and it always poses a great concern. This mattress is a little pricey for some families, but as one other parent said, it is well worth the price if it can bring you a worry-free night of sleep.